BY MARCY SHORTUSE – The rain arrived at the Boca Grande Community Center at almost the same time the dogs, handlers and spectators came, but temperaments were cheery and soon chased the clouds away. With approximately 50 entries on the registry, the competition was lively and the energy level was furiously paced. With Master of Ceremonies and Ringmaster Hank Cox at the helm, alongside the soothing, melodic tones of announcer Julian Keevil and the sure, keen eyes of judges Kathy Berry, Dr. Tom Ervin and John Edwardson, every round went smoothly. It was Oliver Allen (owner Lindsey Allen) who took the top “Boca Bowser” award. Oliver is about two years old. His DNA test showed he is mostly dachshund and standard, wire-haired terrier (maybe rat terrier), as well as Shih tzu and Pekinese. Being a confident dog among dogs, Oliver had no qualms about running against the finest the island has to offer. Lindsey said that after the show they hit the town and stopped at some of Oliver’s favorite shops, so it was a great day for a young dog only off the streets of Hardee County for little more than a year. The wiry little animal is a rescue, from Arcadia, who had been abandoned. “We picked him up on Mother’s Day, so we use that as his birthday,” Lindsey said. 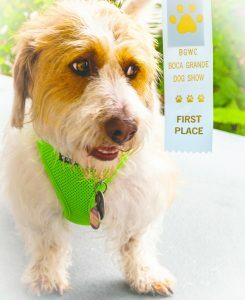 Oliver also took first place in the “Hound” division (thanks to that Dachshund blood). The “Boca Geezer” award went to both Nina Erdekian the Lagotta and Tanner Rowley, an English springer spaniel. Between them they had 112 human years. While Nina takes a two-mile walk every morning and a swim in the pool every afternoon, Tanner is almost totally blind and deaf and pretty much eats whatever he wants. He came from a shelter about 11 years ago, his owner Marsha Rowley said. The winner in the “Toy” group was Louie, a French poodle handled by Anastasia Hoeflich. In the “Working” group, Huckleberry, a Newfoundland owned by Jim Grace, took the prize. In the “Terrier” group, Henry, a Jack Russell owned by Geoff Verney, won. In the “Nonsporting” group, Orso the Schipperke took top honors, much to the pleasure of his handler, Patrick Bigness. In the “Sporting” group, Grant the English springer spaniel took first place, handled by Barb Kimer. Finally, in the brand new “Poo-Doodle” group Rosie Rutkin, owned by Arnie and Sally, took the top place. The “Puppy” group was dominated by Opie, a miniature schnauzer handled by Debby Houck. Denver the golden retriever (handled by Karen Custer) won “Musical Mats,” running a close race against Toby, the Portuguese water dog owned by Fran Edwardson. Hugs, a Labrador retriever dressed all in pink and handled by Jean Johnson, won the “Best Costume” event. The next Boca Grande Dog Show will be held in the spring of 2021. This event is brought to the island by the Boca Grande Woman’s Club. This year’s committee included Sally Allgyer, Mary Hoffman, Chrys Hyde, Rosemary McIntosh, Jan Myers, Leslie Wallace and Ann White.